In the Hindu religion, Varaha is the third avatar of Vishnu, the preserver god in the Hindu Trimurti (trinity). He appeared in the form of boar during the Satya Yuga. A variety of legends concerning the avatar center upon the submergence of the earth in water due to the action of the demon Hiranyaksha. Varaha dove deep into these waters to slay the demon, carrying the earth from below the depths to safety. Hinduism teaches that whenever humanity is threatened by extreme social disorder and wickedness, God will descend into the world as an avatar to restore righteousness, establish cosmic order, and redeem humanity from danger. The avatar doctrine presents a view of divinity that is compatible with evolutionary thinking since it suggests a gradual progression of avatars from amphibian through mammal to later human and godly forms. Most importantly, the concept of avatar presents the theological view of a deeply personal and loving God who cares about the fate of humanity rather than ignores it. Time and time again, the various avatars are willing to intervene on humanity's behalf to protect its overall cosmic wellbeing (loka-samgraha). Hinduism recognizes ten major avatars, collectively known as the Dasavatara (dasa in Sanskrit means ten). Scriptural lists of these ten divine manifestations frequently differ, however; the most commonly accepted has Varaha preceded by Matsya, a fish and Kurma, a turtle; and followed by Narasimha, a man-lion hybrid; Vamana, a dwarf; Parasurama, a man with an axe; Rama, a noble man; Krishna, the teacher of the Bhagavadgita; Buddha, a spiritually enlightened being, and Kalkin, the tenth and final avatar who has yet to arrive. These avatars usually take physical form for the purpose of protecting or restoring dharma, the cosmic principle of order, when it has devolved. Krishna explains this in the Bhagavadgita: "Whenever there is a decline of righteousness and rise of unrighteousness O Arjuna, I send forth Myself" (Shloka 4.7). Vishnu's tenure on earth typically involves the performance of a particular series of events in order to instruct others concerning the path of bhakti (devotion) and ultimately leading them to moksha (liberation). According to Hindu mythology, the earth was once submerged under vast oceans by the demon Hiranyaksha. In order to rescue the earth, Vishnu took the form of a boar and dove into the great waters. Here he killed Hiranyaksha and carried the earth above the water once again. He then mapped the earth’s geography, sculpting mountains and valleys, and dividing it into seven continents. And so the world began another epoche by way of Vishnu’s intervention. Another version of this story describes Hiranyaksha as having a very favorable reputation in the eyes of Lord Brahma, the creator god. As such, Brahma granted Hiranyaksha a boon that no entity, animal, human or divine, could kill him. Having received this boon, Hiranyaksha began to persecute all living beings as well as the gods. He went so far as to steal the Vedas from Brahma while he slept, and then dragged the earth down into the nether regions of the universe. However, he was ignorant of an oversight that had been made by Brahma, who had inadvertently omitted the boar from the list of beings to which Hiranyaksha was impervious. When the humans and gods finally did appeal to Vishnu for help in dealing with Hiranyaksha, he incarnated upon the earth as a boar and promptly killed the demon, after which point he reclaimed the Vedas and brought the earth back to the surface. 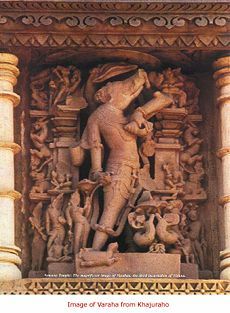 Representation of Varaha, Khajuraho, twelfth-century C.E. Mythical descriptions attribute Varaha with immense size: he is said to be ten yojanas (a Vedic unit for measuring distance believed amongst scholars to be between four and nine miles) in breadth, and one thousand yojanas in height. He bears sharp, fear-inspiring teeth. His eyes are intense, flashing lightning, and he possesses the powerful stride of a large cat. There are two major types of images of Varaha: those that depict him solely in the form of a boar and those that depict him as having boar’s head on a human body. Sculptures of the latter variation usually depict him as having four hands, which carry the shankha (conch-shell), chakra (discus), gada (mace) and the padma (lotus). He is typically colored black. Either the goddess Lakshmi or Bhumidevi, the earth goddess, is pictured beside him as his consort. Most images show him sniffing the earth or carrying it in his arms. These boar-headed depictions date as far back as the second century C.E., and seem to predate those of the fully-boar variety. As a boar, Varaha marks the progression of life from amphibian to mammal. This is perhaps suggested symbolically in the basic Varaha myth, which has the boar conquer the water in order to save the rest of the world. Varaha takes on additional symbolic significance in his relation to the sacrifice. 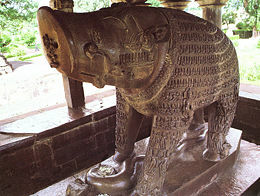 According to Hindu iconography, the boar is emblematic of all aspects of sacrifice: his four legs are the Vedas, his tusk is the sacrificial post, his tongue is agni (the sacred fire), his head is the Brahmana priest, the mucous of his nose is the ghee (clarified butter) while the two eyes represent the day and night. This list of symbolic equivalencies goes on. Thus, Varaha is not only seen as a savior of the physical world but is also prominent within the sacrificial ceremony that maintains it, providing another illustration of Vishnu's power as the preserver god. ↑ Shanti Lal Nagar, Varaha in Indian Art, Culture and Literature. (South Asia Books, 1993). This page was last modified on 18 July 2008, at 17:42.